The Backyardigans Tour Canadian Cities February to April 2014! Have you heard the great news? The Backyardigans: Sea Deep In Adventure live show tours Canadian cities, starting from February and running to the end of April 2014! The Backyardigans Toronto Show will be at Sony Centre For The Performing Arts, on Saturday April 19th, 2014 at 1:00pm! Kids from ages 2- to 6-years old will especially enjoy the show! Check out The Backyardigans: Sea Deep In Adventure tour dates, and find when the show comes to your Canadian city! When Are The Backyardigans Coming to YOUR City? "Who explores a coral reef, discovers a seaweed farm, and joins the jellyfish ballet...all before snack time? The Backyardigans! Pablo, Tyrone, Tasha, Uniqua and Austin are back on stage, singing and dancing and ready to plunge sea deep into adventure! Dive into the action as these five friends explore clues, discover underwater magic, and match wits with an egocentric, seaweed farming octopus and a pair of playful dolphins." "With a splashy range of song-and-dance styles to wade along to...including psychedelic soul, Bollywood, bossa nova, and more, our heroes save the day! With non-stop excitement and surprises, this watery tale will mesmerize, entertain and delight audiences of all ages!" The Backyardigans: Sea Deep In Adventure is a theatrical production based on the top-rated preschool television program The Backyardigans, airing on Treehouse TV in Canada and Nick Jr. in the US. The Backyardigans Live! On Stage show is produced by Koba Entertainment, and is among the company’s roster of other memorable theatrical productions, including Dora the Explorer Live! Search for the City of Lost Toys and Toopy and Binoo and the Marshmallow Moon. 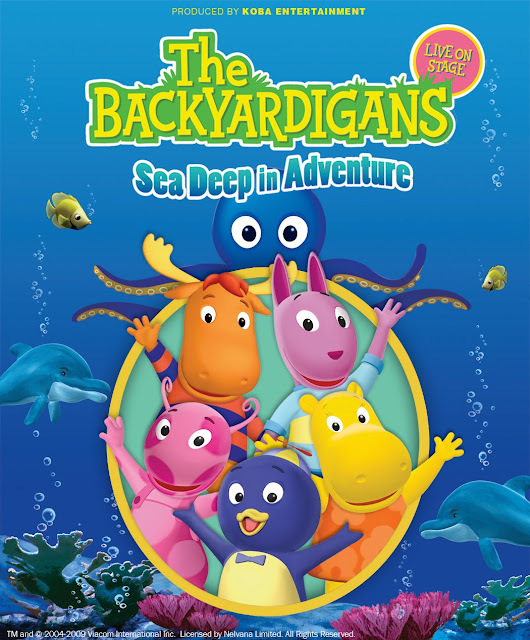 Purchase Tickets to The Backyardigans Live On Stage: Sea Deep In Adventure! VIDEO: Watch a video clip, below, of The Backyardigans Live on Stage: Sea Deep In Adventures show! BUY TICKETS TO THE BACKYARDIGANS LIVE SHOW! WIN Family Tickets (4 tickets) to see The Backyardigans Live on Stage: Sea Deep In Adventures show in TORONTO, on Saturday April 19th, 2014 at 1:00pm! 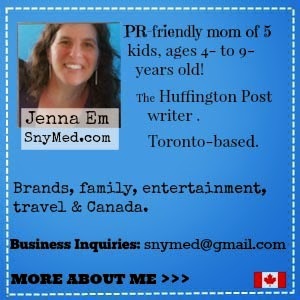 Contest open to Canada, and closes on Monday April 7th, 2013. Leave a COMMENT below, stating if you have a The Backyardigans fan in your household, OR who you would take to The Backyardigans Live on Stage: Sea Deep In Adventures show in Toronto. Then use the entry form, below, to enter. GOOD LUCK! My son is addicted to the Backyardigans!!! Loves this show!!! My son loves Backyardigans. A day does not pass without watching at least one episode!!! My Son (3) love to dance and move with the Backyardigans, we would love to see them live! I would love to invite my best friend's two little girls. Thank you! my son loves them and would love to go!!! I would take my 3 children to The Backyardigans Live on Stage, They are big fans! I would take my three girls! My 4 year old watches the backyardigans. My four year old watches the backyardigans. My 4yo nephew is super-excited to see this show -- got 3rd row tickets! Congrats to the T.O. winner in advance! My daughter Micaela absolutely LOVES the Backyardigans. She is 20 months and dances to the theme song every time. I enjoy watching the Backyardigans with my son ... Pablo is cute! I enjoy watching with my son! My 3.5 year old is a HUGE fan, I'd love to take him! My boys and I are Backyardigan fans!! My 3 year old son LOVES The Backyardigans! The backyardigans is the only show my 2 boys can agree on! And I can't get the songs out of my head! I would give the tickets to my neighbour Bob and his daughter. Her mother has been in the hospital for years now.